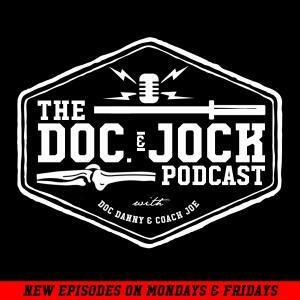 On Episode 156 of the Doc and Jock Podcast we sit down with Julien Pineau of StrongFit Movement. If you aren't familiar with Julien, he's a strength and conditioning coach that is popular in the CrossFit community for his work with Valerie Voboril and Team Invictus. Julien has a phenomenally varied history as an athlete, competing at a high level in swimming, mixed-martial arts and strongman, among other sports. Julien has created a niche in training with strongman methodologies, but he will be the first to correct you if you assume he is a “strongman coach”; he is a movement specialist first and foremost, and with that knowledge he has helped many athletes from strongman to golf achieve their goals.